Hotels, motels, bed and breakfasts, and inns see plenty of traffic day and night. This adds to wear and tear on flooring, necessitating consistent cleaning. 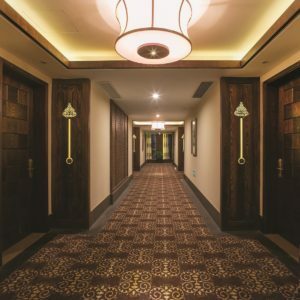 ServiceMaster of Lincoln Park is prepared to help you keep your hotel establishment looking up-to-date, polished and spotless with affordable hotel carpet cleaning services. We will gladly come to your facility in the Chicago, IL, area and use our high-tech equipment and techniques to remove the debris, dirt, and other particulates from your carpeting. Have a particularly tough stain in one of your hotel’s areas? Let us know when you call (773) 346-6767, and we’ll talk about methods to help you avoid the cost of new carpeting. We look forward to working together to make your Chicago hotel stand out! There are thousands of hotels and similar properties operating throughout the Chicago area. Why will someone choose yours over another? The cleanliness of your common areas, sleeping rooms and suites is a deciding factor. When visitors believe your hotel is one of the cleanest in the region, they will be more likely to return, as well as to tell friends, family, and colleagues. This not only helps you maintain a great image, but it can also have a positive effect on your revenue stream. Call ServiceMaster of Lincoln Park, and we’ll make it a priority to beautify your carpeting. Sleeping areas aren’t the only places in hotels that experience high traffic. Banquet and conference rooms are constantly utilized, and most visitors aren’t careful about making sure the floors are clean when they leave. Over time, this leads to a build-up of grime, grease, and other debris in the carpet fibers. Even if your hospitality staff members consistently vacuum after each conference, wedding, anniversary or other special event, a commercial vacuum cleaner isn’t as effective as ServiceMaster of Lincoln Park. Contact our office and we’ll come to your hotel with our advanced equipment and products. Not only can we remove the dirtiness out of your carpeting in banquet, conference and common areas around your hotel, but we’ll leave the room smelling fresh. This makes a great impression on people who are considering your hotel for their next big event. One of the most important aspects of working with ServiceMaster of Lincoln Park is our concierge-style service. Each project is catered to your hotel’s particular needs. Call (773) 346-6767 today.